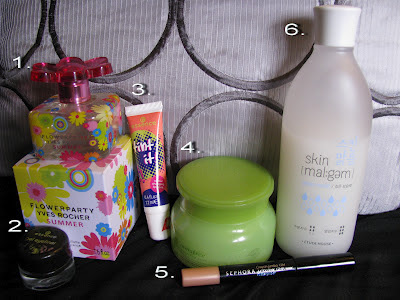 Here are my favourite beauty products from the month of June. The reviews on them will be posted soon. 1. Yves Rocher Flowerparty Summer - limited edition eau de toilete. A sweet yet fresh smell that lasts for quite long on your skin. With lemon, orange and tangerine essential oils. A waterproof gel eyeliner. My first gel eyeliner, actuallly, and I'm loving it! It's really longlasting. It dries quickly and it doesn't smudge even if you rub your eyes. A glossy tangerine lip tint that does not dry out your lips and lasts the whole day. A very refreshing and moisturising sleeping pack. I have a few of these liners but this is by far the one I use the most. Applied on the inner lower lashline it brightens up your eyes instantly. It's skin coloured with a bit of shimmer so, it also works as a highlighter. It leaves my skin feeling soft and nourished. I simply love this stuff! Has anyone tried any of these products? What do you think of them?